A comparison of two EIT images almost two years apart illustrates how the level of solar activity has increased significantly. 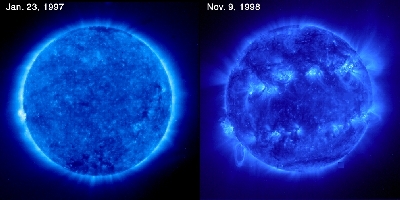 The Sun attains its expected sunspot maximum in the year 2000. These images are captured using Fe IX-X 171 Å emission showing the solar corona at a temperature of about 1.3 million K. Many more sunspots, solar flares, and coronal mass ejections occur during the solar maximum. The numerous active regions and the number/size of magnetic loops in the recent image shows the increase.